St. Louis' #1 STEM themed after-school program is now available throughout Missouri and Central and Southern Illinois! 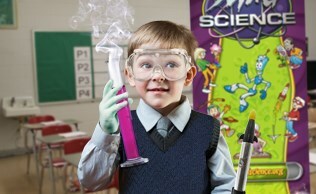 Have your students experience how much fun science can be with Mad Science! Each week students will meet for an hour of inquiry-based science demonstrations and hands-on activities. After each class, students will receive a take-home project related to the class topic. Mad Science will also provide parents with information cards outlining the activities and concepts covered in class as well as additional activities that the children can try at home. Student sign-up materials and online registration. Parents pay for the classes online. Your school does not have to deal with collecting payments and registration forms. Instructors can be teachers or teaching assistants, as long as they have classroom management skill and have a fun and exciting personality. The amount of teachers needed will vary depending on the size of your school as well as student interest. Most distant schools have between 2-4 teachers. We would love to learn about your school. Please fill out our distant school request for information form. A Mad Science staff member will contact you to answer any questions you may have and help determine if Mad Science after-school programs would be a good fit for your school.